Euastacus dharawalus is a critically endangered species that is only known to occur in Wildes Meadow Creek above Fitzroy Falls, NSW. There has been some conjecture as to whether or not the species occurs below the Falls. 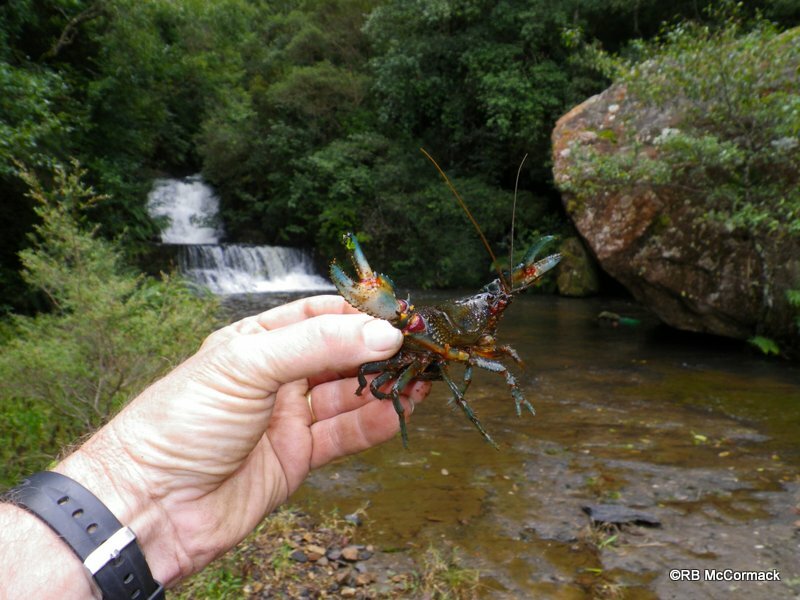 It’s a rugged, inhospitable area below the falls and it had never been surveyed for freshwater crayfish. 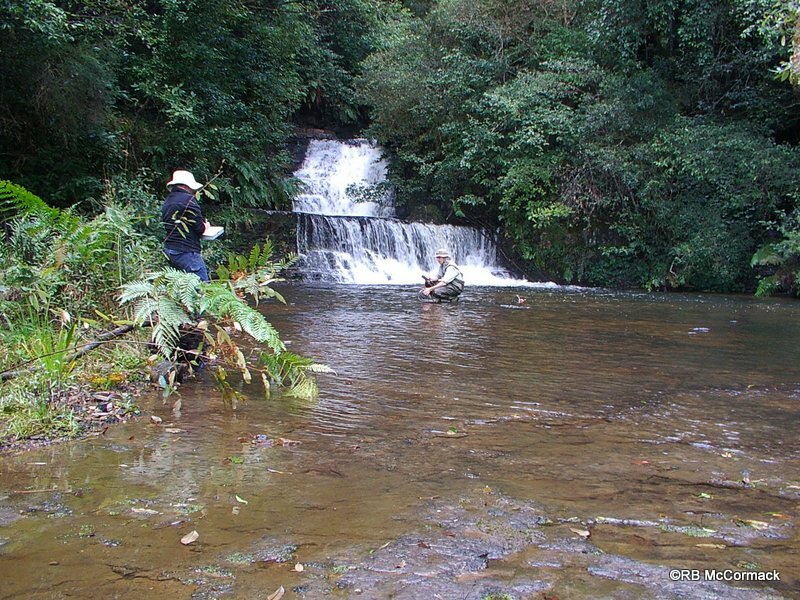 As part of the Euastacus dharawalus project we conducted the seventh survey in Wildes Meadow Creek and Yarrunga Creek below Fitzroy Falls on the 29th and 30th of May 2012. 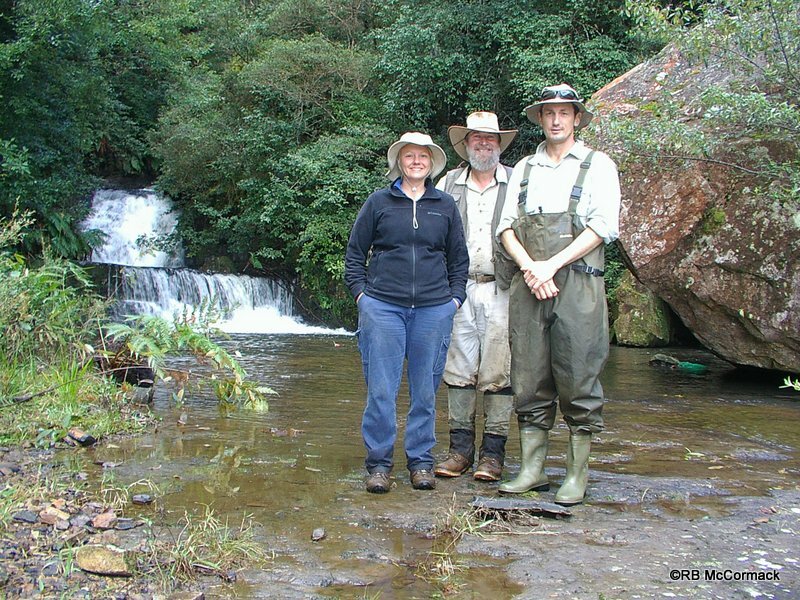 The first site was on Wildes Meadow Creek at the base of the Falls and then a site on Yarrunga Creek 5.65 km downstream from the falls and the last site a further 4.87 km downstream from site 2. These three sites were investigated with the surveys being conducted by Robert B McCormack (Australian Aquatic Biological P/L), Justin Stanger (NSW DPI Fisheries) and Prue McGuffie (NSW DPI Fisheries). Each survey consisted of setting 20 traps (10 green opera house and 10 box traps) along a 80-100 m section of stream for a minimum of 120 minutes. Traps were baited with pilchards and set from the bank. 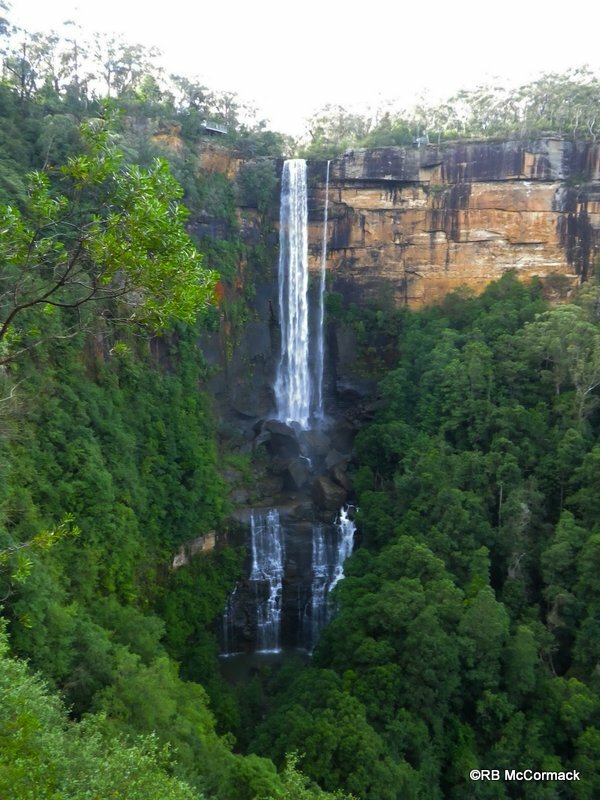 Fitzroy Falls is a popular tourist destination with the Falls dropping 80 m off the escarpment to the creek below where it further cascades over a series of smaller waterfalls and cascades carved deep in the heavily forested lush damp valley. The area below the falls is remote and the only access is from the top of the escarpment. With the assistance of NSW NPWS we managed to find an old disused track to the base of the falls. It was a bit of an effort to get down the escarpment to the base of the falls with our equipment but once there we managed to find some crayfish specimens. The site was extremely rugged and it was hard to find good fishing spots but Justin carried his waders down the mountain and put them on, hoped into the swift flowing stream and managed to find a number of good locations to set some survey traps. Prue and I watched on with a smile as Justin waded the stream and scrambled over the slippery boulders and jumped, scrambled, fell, slid, bounced and climbed the rapids and waterfalls to get to the very base of the Falls. We were unable to find any Euastacus dharawalus below the Falls, only finding Euastacus yanga and Cox’s gudgeons. Interestingly the Euastacus yanga we were finding were an unusual morphological variety without much in the way of abdominal spines, but extra spines on their claws. It was an interesting survey that concluded E. dharawalus does not occur below the falls and I’m grateful to NSW DPI Fisheries for all their help and assistance.